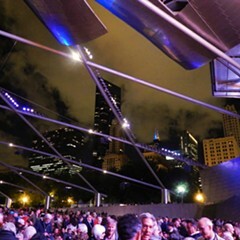 It was a coincidence that word came out last Thursday about the Chicago Symphony Orchestra's $32 million gift bonanza—$15 million of it earmarked for education and outreach—while Lyric Opera was introducing its upcoming plan for its own outreach effort, Lyric Unlimited. 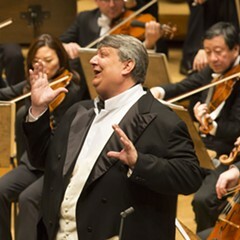 The CSO's big news dropped just as Lyric general director Anthony Freud, creative consultant Renee Fleming, and Lyric Unlimited director Cayenne Harris were explaining to a group of reporters that they've commissioned three short operas for community performances in 2015, along with a new family show that'll be produced at the Civic Opera House. Once it registered (there was a whoa! moment, not much longer than the blink of an eye), the reaction was positive: a rising tide lifts all boats. And a gift of this magnitude validates all efforts in the same cause. —The Property, a klezmer opera by 28-year-old Polish composer Wlad Marhulets with a libretto by Stephanie Fleischmann and based on the graphic novel of the same name by Rutu Modan. It'll be directed by Eric Einhorn, will include members of the Maxwell Street Klezmer Band, and will be presented at the Logan Center for the Arts and the North Shore Center for the Arts in February and March, in conjunction with the run of Mieczyslaw Weinberg's Holocaust opera, The Passenger, in the Civic Opera House. —Second Nature, a futuristic children's opera by up-and-coming 24-year-old composer and conductor Matthew Aucoin, who just happens to have the current Solti conducting fellowship at the CSO (and who came to Fleming's attention when he worked with her daughter). Aimed at kids from eight to 12 years old, it'll be directed by Matthew Ozawa and presented in free performances in August at Lincoln Park Zoo's Cafe Brauer, and subsequently at area schools and other community venues. —El Pasado Nunca De Termina (The Past is Never Finished), a new mariachi opera by the same team that created last year's mariachi production, Cruzar la Cara de la Luna—composer Jose "Pepe" Martinez and librettist (and director) Leonard Foglia. There will be four performances at Benito Juarez Community Academy in Pilsen and one at the Genesee Theatre in Waukegan, followed by two world premier performances at the Civic Opera House, all in March. —The Magic Victrola, a previously announced family show that'll be a flexible vehicle for showcasing opera excerpts. The story line: two kids in an attic discover a phonograph, costumes, and opera albums that come to life. It's a one-hour show by Chicago Children's Theatre's Jacqueline Russell and Lookingglass Theatre's David Kersnar, scheduled for one performance at the opera house on January 17. Freud: "I've tried to find a way of defining opera to make it distinctive from musical theater, and I can't." Fleming: "I welcome the diversity." Freud: "They're not replacing [traditional] operas." These commissions, and Lyric's forays into musical theater are "ends in themselves," Freud maintains, but also a way to get acquainted with potential new operagoers. He noted that "50 percent of the Oklahoma! audience [last year], and 50 percent of the mariachi audience had never been to the opera house before." Meanwhile, at the CSO: the $15 million gift, which is coming from the Negaunee Foundation, will endow and support the symphony's education and outreach program, now to be known as the Negaunee Music Institute at the Chicago Symphony Orchestra. The other $17 million, from the [Sam] Zell Family Foundation, will endow—and brand—the job now held by music director Riccardo Muti.